After the exuberant year 2012 with its blossoming garden landscapes, exploding mushrooms, green comets and wonderful foam sculptures, this year the festival is marked by dance art of Japan. It is precision, unique strength, internalization and concentrated use of physical resources that distinguish many Japanese choreographers and dancers. Two of the central protagonists of the Japanese dance guild are at the “tanz ist” Festival in Dornbirn in June: Ko Murobushi and Hiroaki Umeda. They are joined by the performance artist Aiko Kazuko Kurosaki, who resides and works in Vienna. This is the first “all Japanese” dance and performance festival of that kind in Austria. “Tanz ist”takes place at the premises of Spielboden (its web site also offers information about the arrival possibilities). Along Manga, he is Japan’s most successful cultural export – the Japanese multimedia artist, choreographer and dancer Hiroaki Umeda, enchants the stage with his notebook and performs in the best houses across the world. The works by the Tokyo-born artist are technically precise, sophisticated, full of amazing power, authentic and atmospheric condensed. “In Duo” Umeda confronts his own image and plays with the duplication of the individual. The play was performed in 2008 at the Centre Pompidou in Paris and in recent years, it was invited to important art and dance festivals in Europe, Japan and Brazil.“I consider that my own physical appearance is just one of the elements of various phenomena.” Hiroaki Umeda. Visual flash, sensual experience, highest choreographic precision and the dynamic play with the perception of time and space, define the second part of the evening: “While going to a condition.” It’s an interesting combination of human, robot, sound and light installation and at the same time a revelation of the existence of the total work of art. AIKO Kazuko Kurosaki: ETTÓ – Boiling Water – Debut performance! Boiling water – minimalistically reduced to elements and concentrated action – will turn into a dance and existential poetry that takes the viewer on a journey through cultures and time. The boiling water – the borderline between two states of chemical compound – is a synonym for the present critical situation of our being. Everyday life in Japanese society is linked with countless rituals which are not only echoes of past traditions, but they also stand for the respect of life, actions and things. They stand in strong contrast to life in the frenzied, digitized, Manga-like crazy mega-cities of Japan. The radical transformation process of Japan makes the global fragmentation of society particularly visible. Aiko Kazuko Kurosaki is intensely engaged, among other, in understanding basics of human existence and how to deal with it. Due to her background and her long experience of life in the West, she “translates” the traditional forms and rituals in the contemporary context in her performances. Ko Murobushi is one of the most famous butoh artists in the world Home in Japan he is recognized as a leading heritage of Hijikata’s Butoh original version. He brought the Butoh to Europe, where it strongly influenced the contemporary dance. In his solo Quicksilver he drives his body fully painted in silver to the outer limits. It’s a tortured body which seems to be moving on the border of life and death. A play with dark forces, a dichotomy which emerges form an anti-aesthetic directed against the Western-style beauty ideals, but at the same time, it develops its own, albeit contradictory beauty. This solo performance shows Ko Murobushi once again as one of the most reputable representatives of Butoh. Every moment of life is challenging him to expand the possibilities of Butoh. A dialogue between two people. Steffi and Johnny visit a running sushi restaurant. Already during the first conversation, it comes to an explosive performative parallel world of unspoken thoughts and feelings. Each sushi evokes a story from the unconscious repertoire of human chaotic relationships. Wishing machines are stimulated to generate grotesque parallel worlds and extreme conditions. 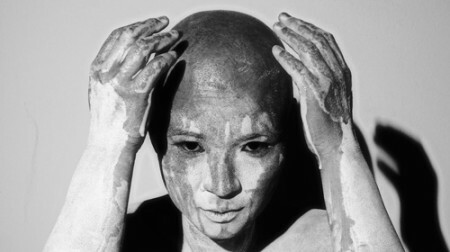 BUTOH EVENING WITH KO MUROBUSHI: A very special evening designed for Tänzer_Innen Ko Murobushi with and without knowledge of Butoh: The evening begins with a short video film of Hijikata’s – one of the founders of Butoh art. Ko will have something to say here. Then he gives a master class. An installation-based contribution to the dance dedicated to Japan, by Barbara Anna Husar. The program will be updated regularly.!! !